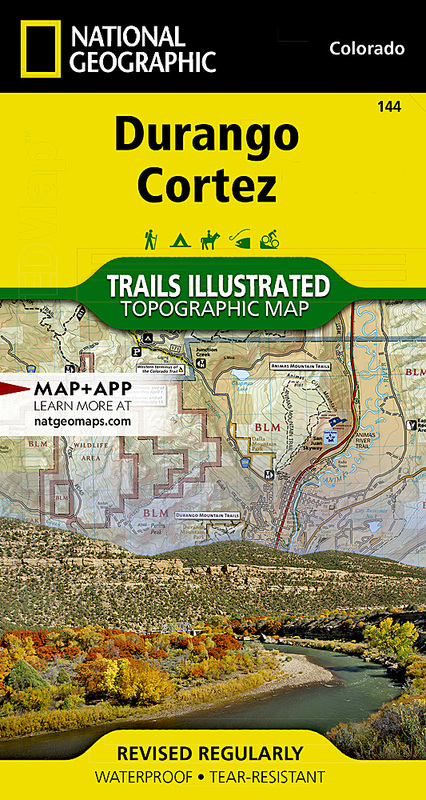 National Geographic's Trails Illustrated map of Durango and Cortez provides unparalleled detail of this culturally significant area of southwestern Colorado. Expertly researched and created in partnership with the U.S. Forest Service, the Bureau of Land Management and others, the map will guide you throughout your recreation or adventure in the area, regardless of the season. The map's coverage includes San Juan National Forest, Mesa Verde National Park, McPhee Reservoir and Recreation Area, Animas River and Valley, Canyon of the Ancients National Monument and Durango Mountain Ski Area. This map can guide you off the beaten path and back again with a wide variety of trails, including trails for hiking, biking and motorized vehicles, plus city and primitive trails, the Animas River Trail and Colorado Trail. The map base includes contour lines and elevations for summits and passes. Recreation and adventure points of interest for all seasons are marked as well, including campgrounds and campsites, alpine and cross-country ski areas, trailheads and interpretive trails, rock climbing and fishing areas, boat launch and whitewater access points, scenic viewpoints and wildlife viewing areas. In addition, the map lists regional attractions along with their descriptions along with useful contact information of both public and private organizations involved in maintaining the region. Other features found on this map include: Durango, Hesperus Mountain, La Plata Mountains, Mesa Verde National Park, San Juan National Forest, Sharkstooth Peak.